Ensure your written texts are translated accurately and with the appropriate stylistic means. From marketing to international correspondence, from legal texts to presentations – the translation you will receive will be custom-made to suit the format, style, phraseology and terminology of your text. Before and after your event, I will be happy to translate any document you may need: schedules, agendas, presentations, conference transcripts etc. 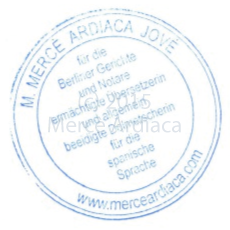 As a translator certified for the Berlin courts and notaries for Spanish and Catalan, I can provide certified translations and arrange for your documents to be authenticated through an apostille. Thanks to a number of text processing tools and computer-assisted translation, handling large or recurring projects is easy and efficient, e.g. with the aid of a team. Since 2007, I have gained ample expertise in a number of fields including legal translations, journalism, politics, Human Rights and commerce. What else can I offer you? A personalised approach with one contact person, a reliable and diligent performance, a timely delivery and strict confidentiality in handling your documents.